Breast Cancer Awareness Merchandise | Breezy Mama Breezy Mama - Expert parenting advice, celebrity interviews, product reviews for kids, moms and babies and more! As we all know, October is Breast Cancer Awareness month. In order to help raise research funds, a slew of companies create one-of-a-kind breast cancer awareness products which, if bought, a portion of the proceeds will go to a variety of breast cancer organizations. How much easier (and fun) can it be to help stop an awful disease? Below you will find a few choices that have come across our desks. . . If the name weeDECOR rings a bell, it’s because Breezy Mama featured one of their adorable wall graphics in a past children’s decorating piece. During the month of October, weeDECOR will be donating 10% of all sales to The Breast Cancer Research Foundation. The easy part will be the shopping–the hard part will be choosing which one to buy since everything on the site is just too cute! To start looking for your wall graphics, click here. Have a sheer shirt stuck in your closet because you don’t know what to put under it? Second Base’s demi camisoles are a perfect layering piece for sheer shirts or tops with too much of a “vee” for school drop-off. Made to go over your bra, the demi camisole is less bulky than a tank, and now’s the perfect time to buy. Second Base has chosen to donate 20% of sales proceeds from all demi camisoles in Ballet Pink (retail value $30.00 – $32.00) sold from their online store to The Breast Cancer Research Foundation. Pictured here (from left): Brittany $32.00, Sarah $30.00, Meredith $30.00. Click here to get your demi camisole. I loved emerginC’s chemical-free face wash, so I know that their Red Carpet Primer must be just as fantastic. To be used after you apply your moisturizer, this primer, “Smoothes and refines complexion, conceals large pores, instantly reduces appearance of fine lines and wrinkles, brightens, fights free radicals, hydrates and plumps, allows for long-lasting, flawless make-up application.” Umm, sign me up! emerginC’s Red Carpet Primer is donating 20% of proceeds to the Susan G Koman for the Cure foundation in support of Breast Cancer Awareness month. To buy emerginC Red Carpet Primer, $44.00, click here. 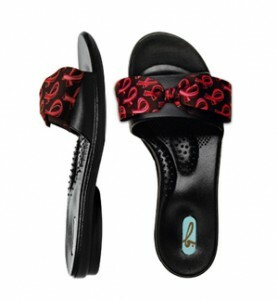 OKA B. shoes has brought two ways for you to help fight the fight against cancer. First, you can buy any pair of OKA B. shoes and they’ll donate one pair to a “cancer patient in need of something special.” Once such outlet which will receive shoes is Hope Lodge, a facility with a home-like environment where those who are going through cancer treatment can recover in privacy. Secondly, if you purchase a pair of their ACS Madison shoes (shown above, and available in two more colors) OKA B. will donate $10.00 to the American Cancer Society. Click here to start your shoe shopping. Still want to help but none of the above really suit you? Then check out Retail Me Not whose editors have put together their picks for Breast Cancer promotions. From the Sephora compact you see above, to a pink Fila watch offered by Kohl’s, there’s something to suit every taste. But what makes this article so great, is that under each product, you’ll not only find a link to the product’s home site but you’ll also see a link to Retail Me Not’s coupons for that particular product. Donate and save money at the same time–what’s not to like? Click here to take a look at the variety of breast cancer awareness products.